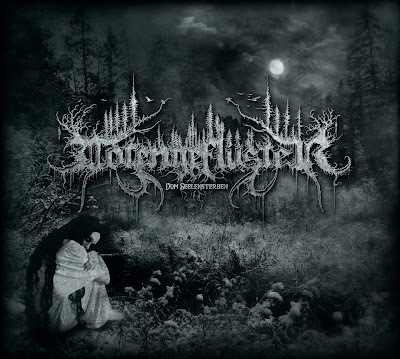 Totengeflüster are a German symphonic black metal band founded in 2007 by bassist/guitarist/keyboardist Totleben. He began writing various song compositions before teaming up with secondary founder, Narbengrund, who contributed lyrical and vocal elements to the existing compositions which Totleben had written for the band in advance. In English, the group's name translates to Whispers of the Dead, which adequately describes their musical style. Eventually the twosome added Schattendorn to their ranks as a live and session drummer to complete their line-up, though he is not considered a founding member nor contributes to any of the song structures. Driven by sorrow, death and insanity, what lays in the depths of Totengeflüster's debut full-length album, Vom Seelensterben? From the very start of the material, audiences will be greeted with an authentic raw quality that gives the music an aggressive, bloody, razor sharp edge right from the beginning; this element is generally absent from the over-polished symphonic metal from this day and age, making it a unique attribute on its own. Narbengrund's vocals are reminiscent of what is heard in Carach Angren and even early Cradle of Filth work. Some of the song structures that make an appearance on the content are blatantly inspired by Dimmu Borgir, circa In Sorte Diaboli, such as what is heard on "Ein Traumgespinst", and there is even some old Emperor influence present. However, that being said, Totengeflüster do have elements incorporated that keep their work from coming off generic or vapid. The song compositions are both aggressive and sophisticated, two principles that are at polar opposite ends of the spectrum, yet Totengeflüster seamlessly blend them together into an onslaught of raw, chaotic energy while still being able to give the material a haunting orchestral break from time to time. "Die Prophezeiung", "gefrorene Tränen" and "Im Tau der toten Morgensonne" are entirely instrumental tracks which powerfully utilize Totleben's ghostly orchestral keyboard structures. The latter track, which is the outro, is a true testament to how provocative, eerie and varying the keyboards can become; it incorporates a dynamic range of synthesizer sounds, from organs, choirs and clean keyboards while deep, cinematic styled bass booms in the background like dropping bombs. As a bonus, the band added "Ein Monolog im Mondschein (Orchestral Version)" at the end of the album. The track finds itself an enthrallingly welcome addition to the track listing, compelling enough to stand solely on intricate orchestral composition rather than relying on any other instruments; listeners may very well find themselves enjoying this version over the main one. Where the vocals are concerned, Narbengrund comes across commanding, dominate, horrific and tortured; this gives a heavy contrast versus the tame, elegant synthesizers that accent the vocal track. He provides a variety of techniques such as sinister whispers, black metal shrieks and rough growls that keep the content from becoming mundane and monotone. His style is very reminiscent of Dani Filth from Cradle of Filth, more specifically the Cruelty and the Beast era, especially within the whispering vocal growls that are present. Due to mixing, the vocal and keyboard tracks largely eclipse the rest of the components, however the guitar can be heard donning an electrified, fuzzy distortion tone while strumming chunky palm-muted riffs, catchy power chord progressions and interesting tremolo picking. Schattendorn drums like an absolute madman, bestowing unto the content driving patterns, rolls, galloping beats and double bass blast that give the record an unrivaled intensity of hellish proportions. Vom Seelensterben is dripping with raw, aggressive symphonic energy from every track. The seasoned orchestrations are the highlight of the material, while the agonized vocals come in as a close second. Every element works with one another to flawlessly provide an intense, destructive, apocalyptic atmosphere that rips the listener apart, leaving them to the depths of insanity by the end of it all. Totengeflüster harmoniously blend combative high speed tempos with slower paced segments without making the two structures clash or sound abrupt as they flow into one another. The only flaw with this album is that the vocals and synthesizers tend to take over the drums, guitar and bass tracks; this can be attributed to the mixing and it would be an easy fix for future material. Highly recommended for all, suggested mostly to symphonic black metal fans and those who long for rawness with their symphonic metal. Make sure to pick up a copy soon! Limited to 150 copies right here.